Elephants continue to surprise us. In her field studies in Namibia, zoologist Caitlin O'Connell noticed that when elephants warily stop to assess the safety of a situation, the matriarch holds a front foot bent so that the front toes firmly contact the earth. She had seen similar behavior in insects and recognized it as hearing vibrations through feet (signals sent from toes to ear). In her book for young readers The Elephant Scientist, she recounts research and field experiments that she and a team of naturalists conducted to verify her observation. I particularly liked the section of the book showing O'Connell and others building and inhabiting a scaffold-like four-story observation station. The station overlooks a water hole that attracts elephants, giraffe, and zebras. And an occasional lion, of course. Wrapped in boma cloth, the electrified perimeter fencing keeps the team safe from the wildlife and let them observe elephant behaviors without disturbing the elephants. The boy in me that always longed for a tree house thinks it would be really cool to live and work in an observation tower in Namibia. As a title in the Scientists in the Field Series from Houghton Mifflin Books for Children, The Elephant Scientist, which was a Robert F. Siebert Honor Book, is filled with photos of the wildlife and the scientists at work. The chapters are concise and fairly quick reading, and the authors include a glossary and reading list in the back of the book. 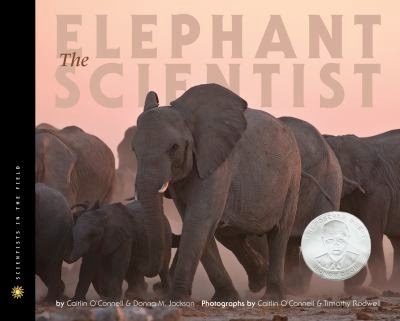 The Elephant Scientist is an attractive book for elephant lovers of any age. Thanks to Bonnie for bring it home. Connell, Caitlin and Donna M. Jackson. The Elephant Scientist. Houghton Mifflin Books for Children, 2011. 72p. ISBN 9780547053448.